It&apos;s hard to believe that the premiere event of the summer is just around the corner. Certainly you all know that I&apos;m talking about the 2017 Hendricks County 4-H Fair -- a much anticipated annual event that attracts folks from near and far. 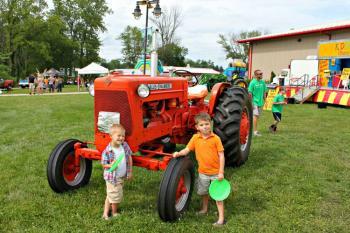 This year&apos;s fair will run July 16-22 at the Hendricks County 4-H Fairgrounds & Conference Complex, 1900 E. Main St., Danville. 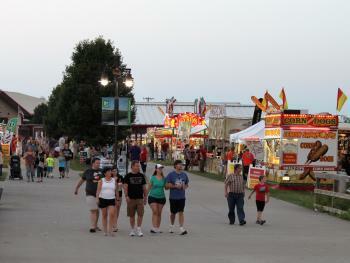 The theme "County Fair Nights, Carnival Lights" sums up all the fun to be had during this week-long, summer event. Admission is $5 per person with a maximum of $20 for a standard carload. Tickets can be purchased at the gate or pre-sale tickets of $4 a person are available at the Hendricks County 4-H Fairgrounds & Conference Complex, North Salem State Banks, Hendricks County Bank & Trust and the Hendricks Regional Health gift shop. Parking is free. The fair fun begins this Sunday, July 16, with a parade from 1:30-2 p.m. After the parade, enjoy the Family Fun Day hosted by Macaroni Kid. Bounce houses, magician Daniel Lusk, LEGO competitions and a scavenger hunt highlight the activities for the kiddos. They can even earn a $5 coupon toward a Wednesday night wristband by completing the scavenger hunt. Stick around for the airplane and helicopter Radio Control Exhibition presented by the Black Sheep Squadron from 4-8 p.m. in the conference center parking lot. What a great way to kick off fair week with the whole family, but that doesn&apos;t even scratch the surface of all the fun in store the rest of the week. 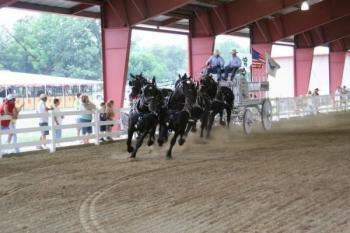 I&apos;ve always been impressed by the work and dedication of 4-H showmen and their families. It&apos;s a year-around commitment, and they take great pride in their work. Let&apos;s face it, most years, it is miserably hot in July. These kiddos and their families practically live at the fairgrounds for weeks, after months of preparation. I know 4-H parents that use all their vacation time for this event. Their hard work yields an awesome opportunity for fair guests to delight in the sight of some incredible animals. There is quite the variety of animals being shown - horse and pony, beef and dairy livestock, rabbits, llamas and alpacas, pigs, dogs, goats and sheep are just some of what you&apos;ll find. There&apos;s even a rooster crowing contest. On the 4-H side, there really isn&apos;t a break in the action. An animal show of some kind can be seen every day, which is too many for me to list. So, get the full schedule here. Additionally, you&apos;ll want to catch the pet parade on July 16. Registration begins at 11:30 a.m.; the parade starts at noon. If your kids are like mine, they always look forward to the rides. There are several opportunities to enjoy "pay-one-price-and-ride-all-night" wristband specials. You can get all the pricing and hours of operation information here. 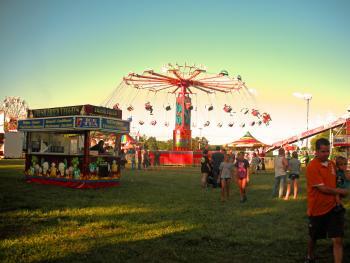 Carnival rides open on July 17. Fortunately, our kids are old enough to meet and ride with friends while the husband and I stroll the grounds. Elephant ear? Yes, please. It&apos;s a win for all. Don&apos;t make the mistake of equating this year&apos;s theme to the carnival rides solely. The fair will also offer some incredible shows throughout the week. Be dazzled by the soaring acrobatic and balance routines of Circus Incredible with aerial acts over 30 feet in the air. These amazing 25-minute shows are free and will be presented at 5:30 and 8 p.m. every day, all week. The fun doesn&apos;t stop there. Catch the World of Wonders & The Escape Explosion shows daily at 2, 6 and 8:30 p.m. World of Wonders will entertain the whole family - under the big top - with sword swallowers, fire eaters, knife throwers, magicians and hula hoopers. The Escape Explosion is both thrilling and comedic. Watch as artists escape handcuffs, a straight jacket and enclosures. Just look for the illuminated, 30-foot aerial rigging to find these performances. As if the above isn&apos;t enough to fill the week, the Hendricks County 4-H Fair is known for shows presented in the Co-Alliance Grandstands. This year is no exception. There is an action-packed performance every night. Catch Supercross Racing on the July 16 and 17 at 7 p.m., Celebrity Kart Races on the July 18 at 7 p.m., truck and tractor pulls on July 19 at 7 p.m. and July 20 at 6 p.m. The much-anticipated Hendricks County 4-H Fair Championship Rodeo begins at 7:30 p.m. on July 21 and the 36th Demolition Derby begins at 7 p.m. on July 22. Many Grandstand performances require additional purchased tickets. Get the full schedule here. In addition to the amazing animal exhibits and carnival shows that are free with fair admission, guests will find free entertainment offered daily. State Bank of Lizton is sponsoring the free, live entertainment stage, where you&apos;ll find a great band performing each night. Sunday through Friday shows will begin at 8 p.m. and Saturday begins at 7 p.m.
Wolves of the World, an entertaining and educational demonstration, will be presented daily at 1:30 and 7 p.m. Enjoy the skill and artistry of wood carving during the Bear Hollow demonstrations presented daily at 11 a.m., 2:30, 5 and 7:30 p.m. So much to do, so much to see. I&apos;m not sure which is more fun -- participating in these contests, or watching them. I&apos;m going to stick with spectating. The hot dog eating contest will take place at 3 p.m. July 16 in Pioneer Village. It&apos;s sure to be entertaining. The pie and ice cream eating contests will follow at 3:30 p.m. The watermelon eating and seed spitting contests will take place on July 17 beginning at 6:30 p.m. I might not be up to the pie-eating challenge, but I do enjoy some fair food. You&apos;ll find all the traditional fair fare such as lemon shake-ups, cotton candy, funnel cakes, hot dogs and elephant ears. 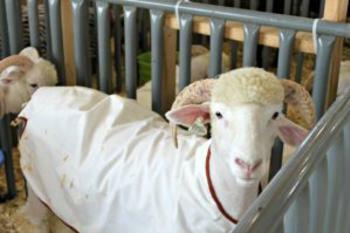 But if this is your first visit to the fair, I must encourage you to make your first stop at the 4-H food building. Who better to make your burger, pulled pork or rib sandwich? Plus, it&apos;s delicious and incredibly affordable. I love their chocolate shakes. Tell your friends and get your tickets for this year&apos;s Hendricks County 4-H Fair Nights and Carnival Lights. I can&apos;t think of a better way to spend the summer! Stephanie lives in Danville, where she teaches at the middle school. She, her husband and their three children like to stay busy. They're often seen crisscrossing Hendricks County for sports and activities. She's a fan of good music, good writing, good wine, good coffee and good people. Her family enjoys traveling every chance they get - even if it's just a road trip to a new town.